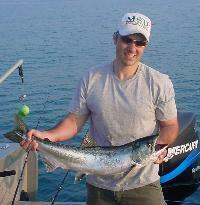 Welcome to If-N-When Fishing Charters Web site. If-N-When Charters specializes in Western Basin Lake Erie walleye and perch, and Northern Michigan salmon out of Sault Ste. Marie. To learn more about If-N-When Charters, click any item on our menu. If you have comments or questions, let us know by clicking Contact Us. Thanks for visiting and be sure to check back often for updated information.